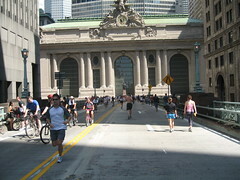 Today was the last of three Saturdays when the city closed Lafayette Street and Park Avenue, so you could ride from the Brooklyn Bridge to Central Park without any cars. The high point for me was getting to ride (and stop and look) around the viaduct that goes around Grand Central Terminal and the Pan Am Building (MetLife SchmetLife). I've driven it a few times but it's usually a madhouse of taxis and other insane people, so being able to ride around it a couple of times and stop to take photos was a real treat. I had lunch in the park and came home via the West Side bike path, a real treat on a day like today, and over the Manhattan Bridge. A little over 20 miles overall, so a pretty relaxing day. I wanted to get involved with that, but alas, my Motivation was wanting. Now I'm motivated, but it's over. Blegh. Glad you got to enjoy it, though.